The Altimeter profile calculates altitude based on reference values. The reference value can either be sea level air pressure value or altitude reference value. 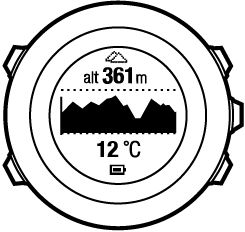 When the Altimeter profile is activated, the altimeter icon is shown on the display. For information on setting the profile, see Setting profiles. If you are wearing your Suunto Ambit2 on your wrist, you will need to take it off in order to get an accurate temperature reading because your body temperature will affect the initial reading.